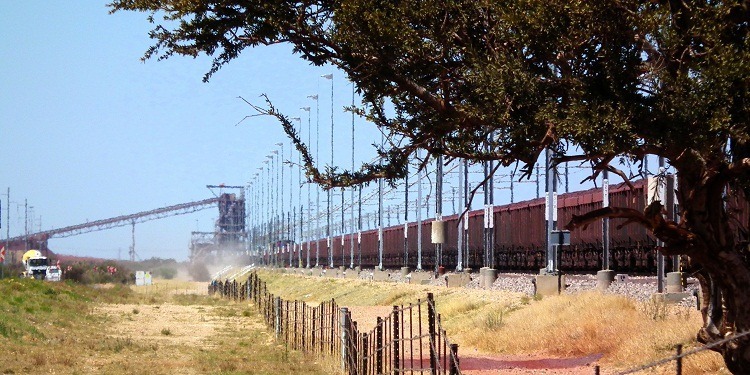 Sishen–Saldanha railway line, a record breaker. | The Photographic Journey of bulldog. The Photographic Journey of bulldog. What you see is what you get……. birds, animals, and all sorts of things, but remember; Work for a cause, not for applause. Live life to express, not to impress. Don't strive to make your presence noticed, just make your absence felt. .
Sishen–Saldanha railway line, a record breaker. A train of true significance. When we recently visited my Son in Kathu I had the pleasure of observing a train being loaded with iron ore. 342 trucks each with 100 tons of ore, 34200 tons on its way to Saldanha Port, 861 km (538 miles) away. Trains employing Radio Distributed Power (RDP) technology. These 41,400 tonnes total mass, 3780 metres (2.36 miles) long trains, that use 8 locomotives and 342 wagons, are the longest production trains in the world. 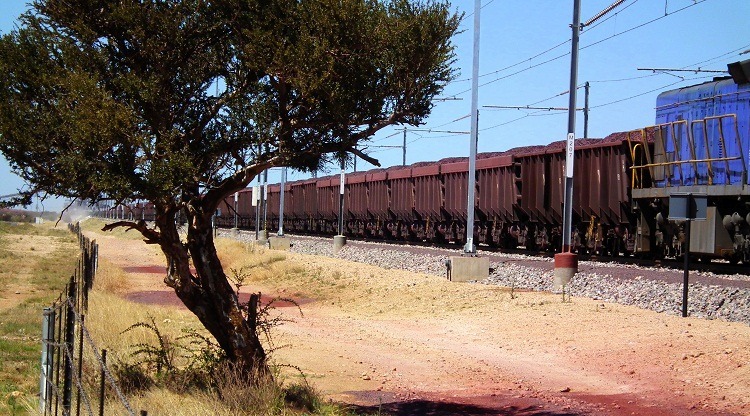 The longest and heaviest train that carried ore from Sishen mine to Saldanha Bay, was a 7,5km (4.69 mile) train of 660 wagons which carried 68 640 tonnes of ore. 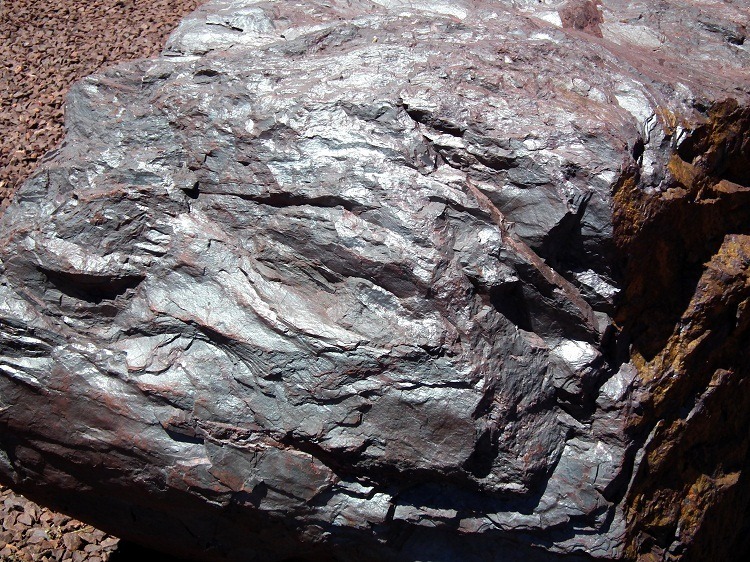 Significant capital has been spent to increase iron ore exports from the deep-water port to meet the growing demand. The infrastructure’s set to further expand as the port is gearing up to increase capacity on the rail line in the future. Current infrastructure at the port comprises two rotary tipplers, four stacker/ re-claimers, two ship-loaders and 25 conveying systems, providing the terminal with a capacity to load 10 000 tonnes per hour into a vessel. Operating 24/7, the ore quay at Saldanha has two berths where two vessels of 310 000 DWT can simultaneously berth at the iron ore jetty. From arrival to departure – including piloting, berthing, loading, draft survey and de-berthing; an ore vessel carrying 170 000 tonnes will be in Saldanha Bay for just 24 hours. A vessel carrying 210 000 tonnes will spend 32 hours in the port, while a vessel carrying 240 000 tonnes of ore will be there for 48 hours. Saldanha Bay Port is bigger than Durban, Cape Town’s Table Bay, Richards Bay and Port Elizabeth’s harbours combined. Saldanha Port Operations submits an annual Environmental Report in line with the Global Reporting Initiative. It respects that it’s located in an ecologically sensitive area, and takes all measures possible to manage the area responsibly. The world’s longest and heaviest train operated on June 21, 2001, between Newman and Port Headland in Western Australia. The train operated 170 miles (274 km) with 682 loaded iron ore cars. The train weighed 99,734 tons and measured 4.57 miles (7.35 km) in length. 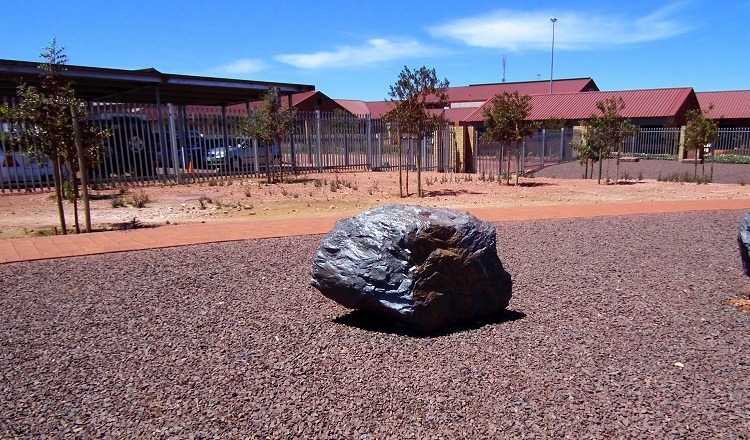 The Sishen Saldanha project was a record breaker in many more respects. Some interesting info regarding. (Most probably rather inaccurate from memory. It was a project that someone should write a book about) It started on a false note. The railways said it could not be done. Yskor had to get special permission from parliament to build a ‘private’ line. A lot of records came about for that time and here I might not have it all correct. The longest ore line, the longest ‘private’ line, the longest train, the most locos, the most ore, the longest train to turn around and not be shunted, the fastest loading, the most km laid in a day, the biggest ship loaded in an SA harbour, etc, etc. Some brilliant solutions were thought up. A new bogie (Wheel carriage) was developed to make all possible. This is currently working all over the world because it is so brilliant. Another first, a management system was developed to make all the locos in a single train share the work evenly. Many revolutionary designs around building the line. This project is something we can still be very proud of. Someone with good research capabilities should tackle this and write a book before all the project engineers of the time die of old age. Very interesting reply… now you have my attention, how many of those records would be found at the Kumba offices? ‘In the old days’ when it was still Yskor all this info would have been available at head office library, close to the Voortrekker monument. Some would be in the project files. I guess if one could get hold of copies of the Yskor Nuus, (I think it was a monthly publication) of those years they would all be there. The real nice stories (Of which I know one or two) one will have to glean from the survivors of that project team. They must be rather old by now. I Joined the project department shortly after the project was completed in 1979. The technical stories and challenges told were absolutely fascinating. I would like to get hold of anyone that have some stories to tell about the difficulties they experienced during the original project. The project was at the forefront of technology in the world at that stage. Some brilliant designs and solutions were done and should be written down for our children. Iscor was great and something we can be very proud of. The comments about the smell in Saldanha is unfair, as I am an ex SAS Saldanha sailor and we loved the place ! If there are 8 locomotives, the question is “is this a real train or modified conveyor betl”. a real train should have locomotives in front and maybe a helper at rear. The strength of the couplings shall the issue. Special couplings had to be designed originally. Nothing the SA railways had could handle the forces. The coupling must also ‘twist’ as the wagons must be turned through 180 degrees for offloading, two at a time. This was upgraded more than once. The final solution came when they got the management system right to synchronise the locos to share the load evenly. They are all controlled with a radio signal. They can have locos at the front, rear and more than one pack in between. The distances could be measured in km. We were the first in the world to sort that one out. I recently heard that service road alongside the line has been closed to the public. Then a month ago I bumped into a Transnet official in Loeriesfontein and said the road was still open to the public. Do you know something about this? What was used equipment was used to stuff each wagons with Iron Ore? Any one please? Thank you for there visit and look in.. I spend hours trying to capture good shots of the trains when they leave Kathu.. next time I’m there maybe I can get a tour of the loading etc from you..???? So interesting. I remember seeing the iron ore trains going from the Iron Range in Minnesota to Silver Bay or Taconite Harbor on Lake Superior to be shipped out. That is one LONG train and one HUGE rock! Very interesting stats, amazing the things we take for granted. Sable antelope on Akabeko Golf Course. Grey Heron on Akabeko Golf Course. Akabeko Boutique Hotel and Golf Course. Akabeko Boutique Hotel Golf Course. Black and Blue Wildebeest.. and not from fighting. Camel Thorn Tree… an endangered or protected tree. The Oppenheimer Helicopter, a sight to see. Delicious Monster, Split-leaf Philodendron and Mexican Breadfruit..
Ver in die ou Kalahari…. far in the old Kalahari….